All parents want to raise kids that are grateful for what they have and are generous enough to give back to those that are in need. Well, authors Karen Duncan and Kate Hannigan Issa have written a book that has awesome activities that help kids give back. The book is called The Good Fun! 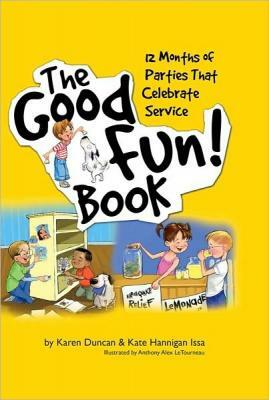 Book: 12 Months of Parties That Celebrate Service. It will hit stores on October 22, 2010 and coincidentally it is also National Make A Difference Day! It's perfect for preschoolers on up through the teen years. Even adults can get great ideas on giving back to their communities. What could be better than having fun while doing good things for the city you live in and the people around you. The book helps young children engage in their communities to do some good while having a good time with family and friends. Whether it's a party to help animals, a party to collect sports equipment for needy kids, or a party to make goody bags for needy families, this book will have your kids giving back in no time. It includes 12 party plans to help mostly elementary school aged children make a difference. It's fill with tons of ideas that include participation from friends, family, classmates and more. It promotes critical thinking, problem solving and most importantly, generosity! It even includes invitation suggestions, craft ideas, recipes and charity profiles. It's a great tool for parents and teachers that are interested in participating in service projects with their little ones while teaching them real life skills. It helps educate children on charities and non profit agencies that were created to help people in their communities and those around the world. This book promises to deliver by getting kids excited about giving back! It'll be $15.95 and, in my opinion, worth every penny!